Jean Kazez: Is Meat Green? The problem Mitloehner highlighted is that the FAO performed what’s called a full “lifecycle analysis” for the livestock industry. In other words, it added up emissions from things like fertilizer production and land-use change in addition to those from cow burps and manure. It did not do the same for the transportation industry, however, tabulating the emissions from fossil-fuel combustion, but not from automobile manufacturing or road construction, for instance. 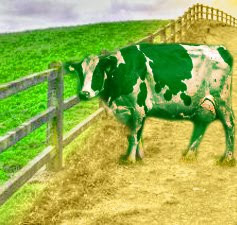 A study last year by the National Institute of Livestock and Grassland Science in Japan estimated that 2.2 pounds of beef is responsible for the equivalent amount of carbon dioxide emitted by the average European car every 155 miles, and burns enough energy to light a 100-watt bulb for nearly 20 days. What's being compared in that passage is generating 2.2 pounds of beef (which does take fertilizer, land, burps, and manure) and driving a car for 155 miles (not manufacturing it). I think I read the FAO statistic the same way. 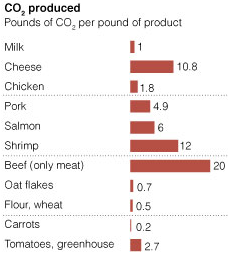 Generating meat produces greenhouse emissions comparable to driving planes, trains, and automobiles. But yes, people who read the "Livestock's Long Shadow" statistic as a lifecycle-to-lifecycle comparison would have gotten the wrong idea. Over here, Don Le Pan wonders why environmentalists don't promote veganism. But if your concern is just the environment, why would you? Wouldn't this be like telling people to buy bicycles instead of just encouraging them to buy smaller cars? To be green, you'll want to eat leass meat, but also make distinctions between different animal products, as the chart (from this article) makes clear. Of course, climate change isn't the only "green" issue. But just concentrating on that, it makes a big difference whether you eat chicken or beef. Hmmmm. Why is milk so low compared to cheese? Just guessing, but isn't cheese basically super-concentrated milk? Another thing--who eats a pound of cheese? It would be good for that chart to compare servings instead of pounds. Good point. The "pound of" is quite missleading on a cross comparison. milk undergoes less processing than cheese is what I would imagine. Milk goes from the cow, to processing, then to the store. Cheese goes from the cow, to milk processing, to cheese processing, then to the store. Cheese processing is fairly intensive work too. Processing = Fossil fuel consumption. But I think there is another problem here... Beef produces way more greenhouse gasses than chicken, but it is FAR more easier to obtain humanely treated cattle (which is about 60% factory farmed in the US) than it is to get chicken (97% factory farmed). So it may be more green and even more healthy, but it is less humane. I googled it and read that it takes about 10 pounds of milk to make a pound of cheese. So that accounts for all of the extra CO2 except .8 pounds. I guess that's what comes from running the cheese-making machine...or whatever! Very interesting indeed to have these comparison figures on greenhouse emissions; thanks Jean! Thanks too for pointing to my last blog posing on all this. On your question as to why environmentalists would promote veganism as one option (along with other positive green options such as eating only free-range meat)--for the same reason that environmentalists do in fact promote *both* riding bicycles *and* buying smaller cars. When it comes to decisions about what we eat, as with decisions about how we get around, there is more than one possible way to behave better towards the environment. The point you make in passing that climate change isn't the only green issue is a vitally important one here; the conventional pollution issues associated with factory farming are massive. In all the fuss over percentage contributions to greenhouse gas emissions that fundamental fact is sometimes lost sight of. Good to see you noting it! I've never seen a car-abstinence campaign coming from environmentalists. That would seem to be the equivalent of promoting veganism. Use cars less, ride bikes more often, buy hybrids--they ask for all that. But I don't see anybody asking for abstinence.